Located directly on the pristine coastline, DoubleTree Ocean City Oceanfront has undergone an expansive renovation that includes all guest rooms and suites, as well as all public guest areas. The moment you step into the hotel lobby you’re welcomed by a friendly staff, a coastal vibe with a twist of fun that flows throughout the hotel, and of course, a warm DoubleTree Chocolate Chip Cookie!! Mention code GUEST and receive up to 20% off your stay. Valid Now through June 13, 2019. Subject to availability. 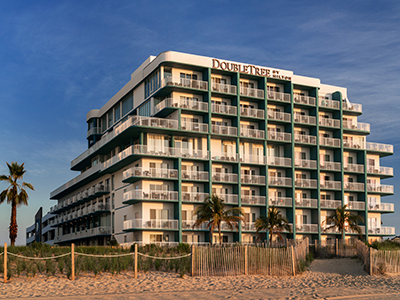 The DoubleTree by Hilton Ocean City Oceanfront is a stylish Maryland hotel just steps from the beach and in walking distance to Ocean City's lovely Boardwalk, the Ocean City Convention Center, Jolly Roger Amusement park, Splash Mountain, and a variety of fantastic restaurants.